This past New Year's Eve my mate had a party at his place (can you say, "Harbour views"??!!) and we decided to go with a Basque theme with pintxos. Pintxos are somewhat similar to tapas but they are generally served on small pieces of bread and are a big part of the Basque culinary scene. I decided to throw together a couple recipes and one was a riff off another dish that I make but modified to be a pintxo-style plate. The primary ingredients are smoked salmon, grated eggs, and creme fraiche. They were definitely a visual star but they must have been pretty tasty as the whole plate disappeared pretty quickly. The recipe is dead simple. Firstly, hard boil the eggs for about 10 minutes and then separately grate the whites and yolks with a Microplane (or simple grater) and set aside. Rinse the capers and then finely dice the capers and red onion. Chop the smoked salmon to mince-like consistency and leave in the refrigerator for an hour. Slice the baguette into thin slices. 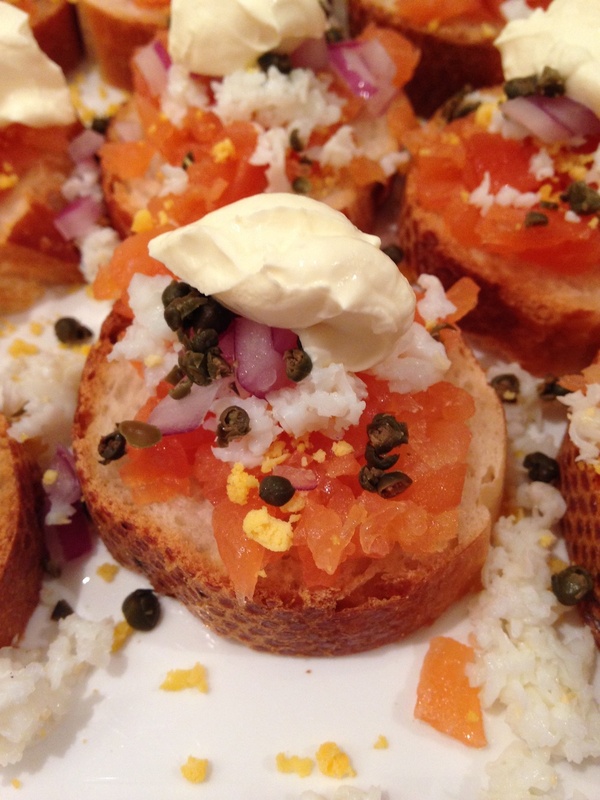 Add a spoonful of salmon to each piece and then sprinkle over the egg yolk, egg white, red onion, and then capers. Top with a dollop of creme fraiche and serve. When you get a whole plate together it's quite a sight!